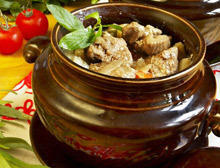 "Today we are going to present to you this Bulgarian favorite for village-style livers. 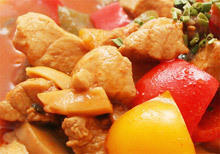 The fact that it is cooked in a clay pot makes the recipe even more delicious and full of flavors." Wash the chicken livers well in a colander under running water. 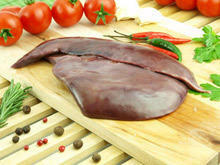 Put the livers in a large pan with half the oil and cook until their water evaporates completely. Stir them from time to time. Once they start to crisp, pour in the remaining oil and add the onions that have been chopped into crescents. Stir and cook until the onions soften. Remove from the stove and pour the livers into a clay pot. Cut the roasted peppers finely and add them to the pot along with the tomatoes and finely chopped parsley. Season with black pepper, salt, sugar and paprika. Stir well and put it to bake in a slightly heated oven, then increase the heat to 392°F (200 °C).